Yesterday, besides the Sunset Overdrive game, another project got the information concerning its Season Pass. This time, we’ll tell you about the upcoming action-adventure in the Lego series. The Lego Batman 3: Beyond Gotham Season Pass is the first one throughout the history of all projects in this franchise. It will consist of six DLCs, each one of which will contain the new missions, the additional characters and vehicles. Three expansions will become available once the game is released on November 11th in North America and November 14th in Europe. So, here are some details about the DLCs’ content. First three add-ons of the Lego Batman 3: Beyond Gotham Season Pass will be titled as The Dark Knight, Man of Steel and Batman 75th. The last one is dedicated to the anniversary of the Batman’s appearing in the Detective Comics’ books. In this expansion, the players will get a chance to play as Joker, Harley Quinn or Dark Knight. The Man of Steel add-on will let the gamers try the role of a Superman’s father - Jor-El - and fight against General Zod. In the third DLC - The Dark Knight, - the players will have the widest variety of characters: Batman, Joker, Bane, Catwoman and Commissioner Gordon. The content of other expansions, which the Lego Batman 3: Beyond Gotham Season Pass will include, as well as their release dates are still being kept in a secret. 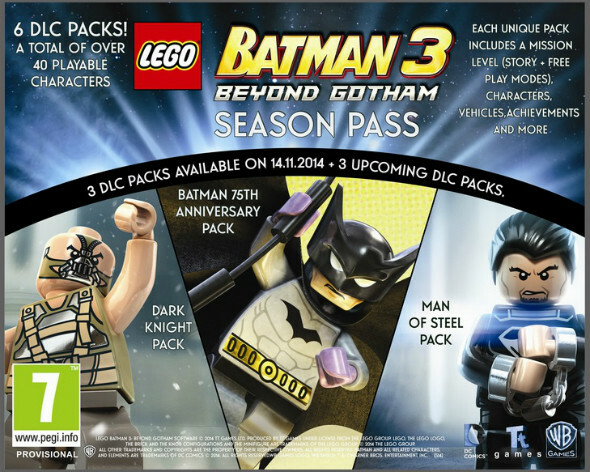 The Lego Batman 3: Beyond Gotham Season Pass will be launched on PC and consoles of two last generations. It will cost $14.99. By the way, separately, each DLC will be priced at $2.99.